I recently started subscribing to the TED talk RSS feed, and I really love coming home every day after work and listening to smart people talk about cool ideas. If you aren’t familiar with TED, you should be. Most of the talks are fantastic and very thought-provoking. So you can imagine I was excited when I saw that today’s talk was about Mars! The talk was given by Joel Levine, the principal investigator for the proposed ARES mission, which is a rocket-powered airplane that would fly for a couple of hours on Mars and study the atmosphere, surface and subsurface. He starts off with an overview of Mars exploration history, describing the Mariner flyby in 1965, followed by images from the Viking orbiters and landers. He says that the Viking landers returned the first images ever from the surface of another planet, but that’s actually not true! That achievement actually belongs to Venera 9, which, astoundingly, returned photographs from the surface of Venus in 1975! Everyone forgets poor Venus. Levine goes on to talk about some of the stunning topographic features on Mars, highlighting Olympus Mons, Valles Marineris and the Hellas basin as the largest volcano, canyon and impact crater in the solar system, respectively. If you really want to be pedantic, Olympus Mons is the tallest volcano, not the largest, but it’s not really a big deal because Mars also has the largest one (Alba Patera). But what really made me pause for a moment was that Hellas is not the biggest crater in the solar system: the South Pole Aitken Basin on the moon has a diameter of 2500 km, 400 km larger than Hellas! 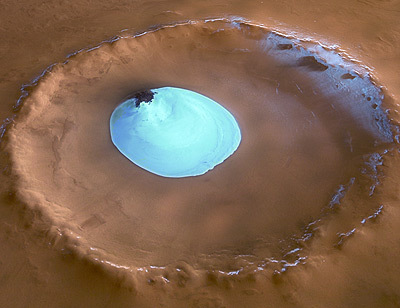 He continues and talks about the mysterious crustal magnetism on Mars and the fact that all of the water on present-day Mars is in the form of ice, and all of this is fine, but then a slide comes up which Levine claims shows “recent” photos from the Mars rovers with evidence of very fast-flowing water on the Martian surface. The only problem is, the images on the slide are all orbital images! I can’t say for sure but I think they are from the MOC camera, which stopped functioning in 2006, three years before this talk was given. Yes, the images show features that could be due to ancient flowing water, but they are certainly not from the rovers, and they’re not very recent either. I got even more suspicious when Levine showed this picture of a crater filled with ice and claimed that it was taken a few weeks ago and had not yet been publicly released. The only problem is, I remember seeing that picture years ago. A quick web search reveals that it was released in a 2005 press release. Levine also misspeaks and says that the crater is filled with liquid water, but immediately corrects himself so I’ll let that slide. I’m baffled by his claim that it is a never-before-seen image though. 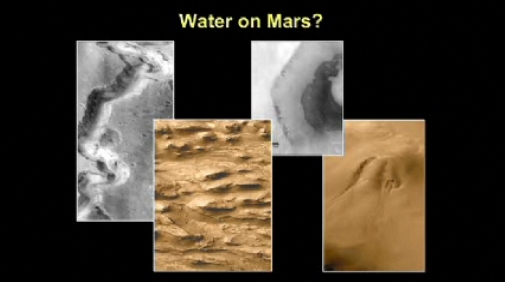 Shortly after the icy crater image, Levine makes a very strong claim that Mars once had oceans. He doesn’t equivocate at all, he states this as a fact. I find this to be very misleading. Yes, there are some hypotheses about a northern ocean on Mars, but the evidence just is not there to make such a definitive claim, and to pretend that it is gives people an incorrect impression about the Mars community’s consensus. Even worse, later on in the talk, he claims that the northern lowlands are smooth because they were protected from impacts by an ocean. This is patently false. Oceans are not an effective protection against impacts and if you think about it, you’ll see why. The average ocean depth on earth is 2.3 miles. 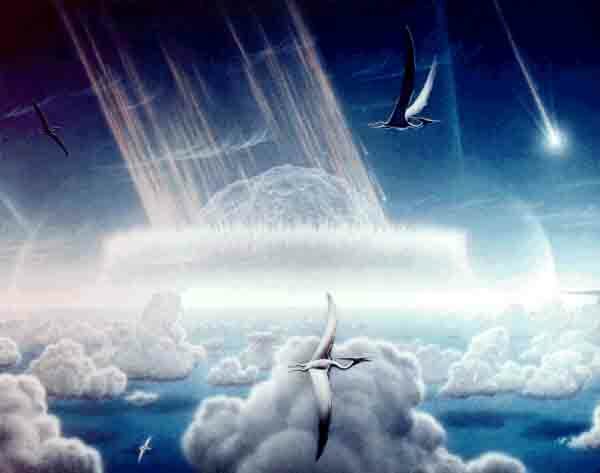 For comparison, the object that killed the dinosaurs was at least 6 miles in diameter and was traveling at tens of miles per second. It went through the ocean like it wasn’t even there. Also, there is evidence for craters in the northern plains. They have been buried but they still are just barely visible in elevation data. Of course, an ocean would be one way to bury a huge expanse of the surface, but if the ocean isn’t thick enough to block impacts, then the burial must not be very old, and all evidence points to the water on Mars being a very ancient phenomenon. Ok, oceans aside, Levine goes on to talk about the recent detections of methane on Mars. He summarizes the results well enough, but draws a misleading parallel with the earth. He says that 99.9% of Earth’s atmospheric methane is biogenic, which may well be true. But that doesn’t mean that life is the only possible source of methane on Mars! I don’t know the exact numbers involved but it would have been much more informative if he had compared the estimated amount of methane on Mars to the estimated amount from abiotic sources on the earth. The second half of the talk focuses on the ARES Mars airplane mission. I have actually visited the lab in Langley that works on this concept and seen the models of the plane. It is undeniably really cool, but I am not convinced it is the best way to explore Mars. The problem with an airplane is that you need active control to keep it from crashing. 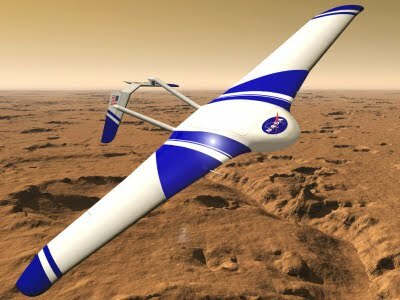 Of course the technology exists to fly planes automatically, but to do so on Mars could be difficult. And even assuming that you can get the plane to fly automatically, it would only last for a couple of hours at most. It would collect some fantastic atmospheric and magnetic field data, and some very nice images and video, but it would only be able to cover a few hundred kilometers. I think if you want to fly something on Mars it should be a balloon. The thin atmosphere is not ideal for a balloon, but they have the advantage that they fly without any active control: they’re lighter than air! It would be a slower ride, for sure, but it could last much longer than an airplane, and the winds could carry the balloon long distances. In case you couldn’t tell, I was disappointed in this talk. For most people, it will be very enjoyable and they will probably learn something about Mars and about a cool proposed future mission, but the talk also had a lot of misinformation in it. Some was very minor and innocent, but the certainty with which the ocean hypothesis and the biogenic origin of methane were presented struck me as misleading. I am all in favor of getting people excited about exploring Mars, but we should not give them the wrong impressions about the current state of knowledge. There’s plenty to get excited about without distorting the truth, whether it is intentional or not. That’s why I decided to write this blog entry. Is some of it pedantic? Yes. But I wanted to set the record straight so that maybe a few people get a more accurate picture of the red planet. This entry was posted on March 25, 2010 at 9:17 pm and is filed under Astrobiology, Current Research, NASA, Skepticism, Water on Mars. You can subscribe via RSS 2.0 feed to this post's comments. Both comments and pings are currently closed. I think your worries about the MSL jetpack are biasing you against active control! That’s really not such a big deal in the engineering world. We’ve gotten very good at it, and all spacecraft include a good deal of active controls already. Not to mention automobile cruise control, humidity-sensing dryers, the movable heads on hard drives, adaptive optics on telescopes, etc. As soon as a closed-loop glucose monitor and insulin pump become available, I’m going to bet my life on active control! Ok, so I guess I emphasized the control aspects too much. :) My main complaint is really that it just doesn’t make sense to me to design a mission that will last at most a couple of hours. The answer is that “Prometheus” is totally the wrong name for what I meant. Mea culpa. Wow. While this guy may have inspired a few minds regarding Mars, he could have easily discredited the movement entirely by his assumptions. And yes, that picture was from 2005! (I definitely remember that photo!). Some weird mistakes by Levine. Could that photo be a repeat photo of the same crater? Agreed that balloons outclass planes for Mars missions, but now that satellite images are so detailed, I think that both are outclassed by landers and satellites for priority. Here’s my question – has radar-mapping been applied to the areas with methane emissions? This could help tell whether there’s liquid water near the surface and may help the analysis of the source. It might be a repeat image: it would make sense to re-image an icy crater to look for seasonal changes, but his emphasis gave me the impression that he thought it was a new discovery. I agree that with the sort of orbital coverage we have now, a flying craft might not be the best. Regarding radar mapping, the problem is that the orbital radars around Mars observe very long and narrow strips, but the “localized” methane plumes are still just fuzzy blobs hundreds of kilometers across. Also, I’m not sure what radar would reveal in terms of methane. It might show areas with buried ice, but that’s no guarantee of methane. I haven’t heard of any ice detections in the areas in question, although that doesn’t mean there haven’t been any. Thanks Ryan – I thought the radar could detect liquid water and it seems both hypotheses for methane require liquid water. Maybe they don’t require much liquid water, though, or can make use of it from deeper than radar can penetrate. You’re right, they do require liquid water, but probably not enough to be seen on radar. The radar sounding instruments really just detect changes in how good materials are at transmitting radio waves: so you get a strong signal at the transition from atmosphere to rock, or atmosphere to ice, or ice to rock. Their resolution is pretty low, and there isn’t enough liquid water to detect within the depth that the radar can penetrate. I think whatever the cause of the methane it’s probably coming from deeper down.